HD video recording and monitoring secures and protects your home 24 / 7. From The Living Room To The Playroom To The Back Yard. Home camera systems lets you see clearly day or night, with full HD movie quality video, night vision, and 1920×1080 resolution. Watch from your security keypad panel or tap into video from anywhere in the world. At home or away, you can view live video of the back yard, front yard or any area of the property with a simple tap of your smart device or by logging onto the online dashboard. Deter unwanted activity and keep an eye on what matters to you and you family with smart outdoor cameras from Brinton Security. 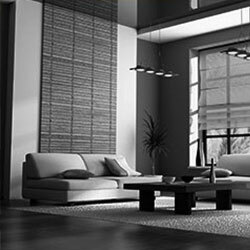 Your indoor camera can be set to record upon sensed motion, for scheduled time frames, or continuously- it’s up to you. See and hear what is going on at home when viewing the live streaming 140-degree field of view image. 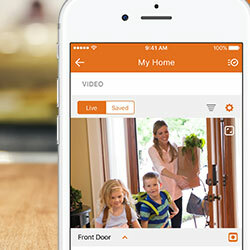 Get instant alerts with smart clip capture or never miss a moment with continuous recording. A well-rounded home video surveillance system will include other modules that are essential to protecting your home and family. The added protection of burglar and fire alarm systems are available from Brinton Security. 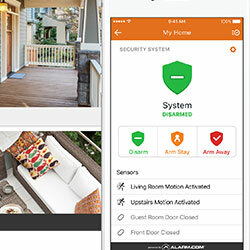 Every home security system that we install can be easily upgraded to include home control with Z-Wave home automation systems and whole home audio.